I’ve been cataloguing some of my Paddington-the-Bear adventures in 2017. This year was the first time I went to New York (see A Babe in the Woods: Derek’s Literary Adventures, and Questing in New York! NYCC 2017). I had some other secret adventures this fall that I haven’t blogged about, but recently I had a bigger adventure! For the first time ever, I was invited to a literary conference to be an Author Guest of Honor. It was the 4th International Science Fiction Conference in Chengdu, Sichuan, China. 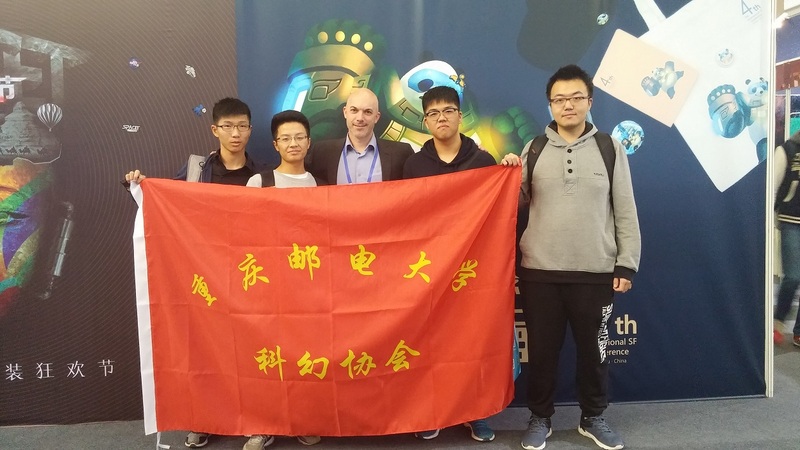 It was sponsored by SFWorld, a Chinese magazine and book publisher, with media and tech giant Tencent as one of the sponsors. I was one of about a dozen foreign authors and editors in attendance. Here’s a shot of some of the billboards outside the event. 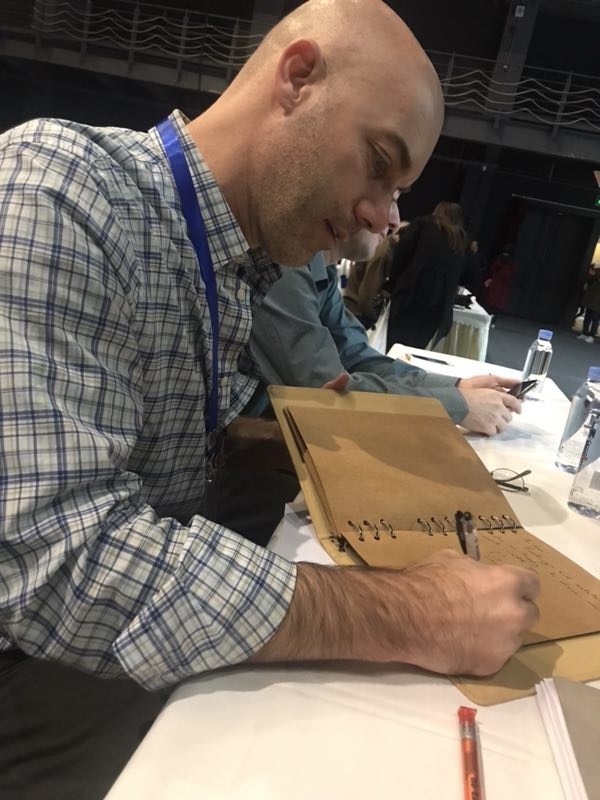 Among the international guests were authors Michael Swanwick and Ted Komsatska from the USA, Taiyo Fujii from Japan, Robert J Sawyer and I from Canada, and editors Neil Clarke from the USA, Francesco Verso from Italy, con organizer Crystal Huff from the USA, and a few others. 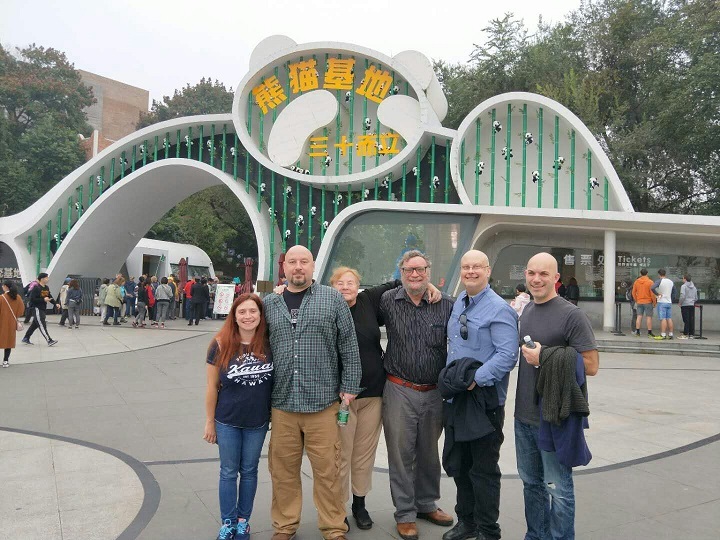 A few of us got to visit the Panda breeding facility the day before the conference started. We defied death, getting close to the pandas, despite warnings about our safety. 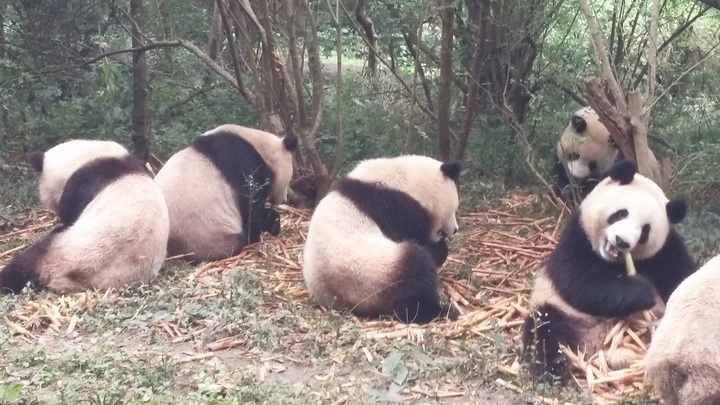 Luckily, the well-known aggression and surliness of the pandas was not on display while we were there. Apparently they’d consumed enough prey the week before. 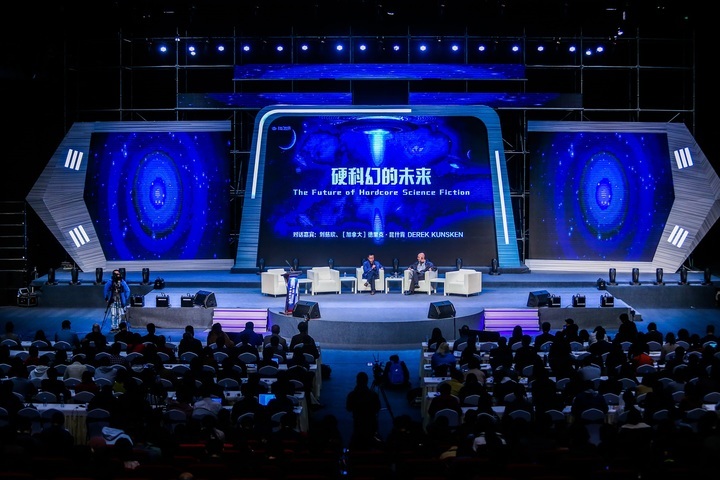 Literary science fiction conferences are still finding their format and shape in China. This one had corporate support and fans were flown in from various part of China. I got to meet a number of university science fiction fan clubs. 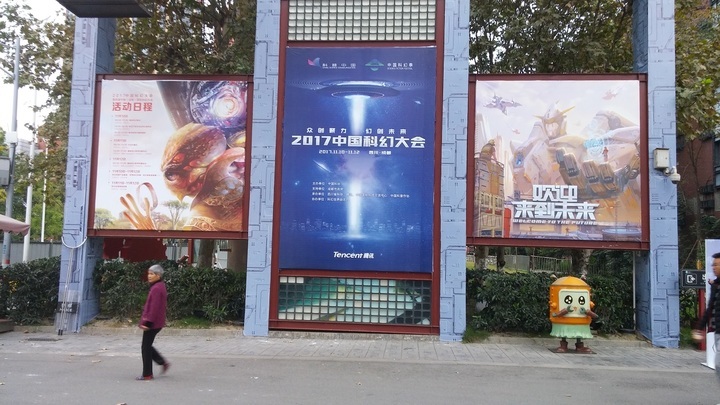 The conference also flew in academics and some of China’s science fiction luminaries like Liu Cixin, Qiufan Chan, Xia Jia, and others. Many of these writers have been translated into English and published in Clarkesworld (and two of them have won English-language Hugos!). Check out clarkesworldmagazine.com. You can read for free. Same goes for lightspeedmagazine.com. And for a small price, you can pick up “Invisible Planets”, a collection of Chinese SF stories translated by Ken Liu. They’re really good. While I was there, I attended panels and plenaries. Earpiece simultaneous translation was available and I had a translator assigned to me for the three days of the conference. She was great, and did her best to try to show me which foods from the Sichuan menu wouldn’t burn my mouth. I also signed autographs, a relatively new experience! I was a panelist on a panel about SF in drama (movies/TV) and literature. 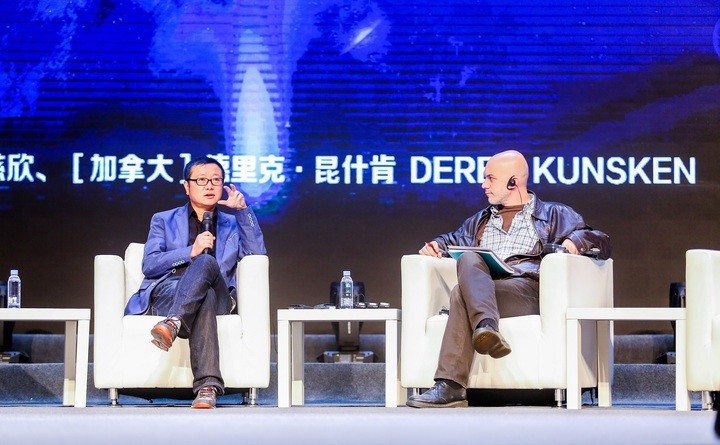 I was also in a two-person plenary discussion with English and Chinese Hugo winning author and international best-seller Liu Cixin. Our conversation ranged over world-building, sense of wonder and science. It was an amazing conference and it would be hard for me to imagine a better such experience. I made lots of new friends, ate great food, saw interesting things, learned more about China’s culture and science fiction, and I would go back. Incidentally, China is interested in hosting a WorldCon, and some of my expedia searching has shown me that flights from Ottawa to Chengdu were in the neighborhood of $900 Canadian, and the hotel they got us in downtown Chengdu was about $110 Canadian a night. 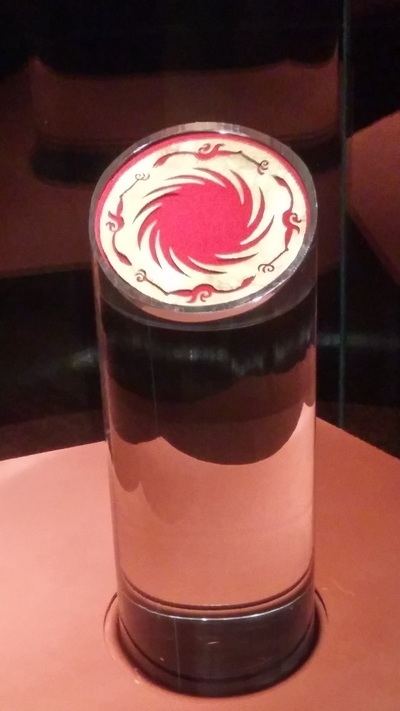 I don’t know how much more or less expensive that is compared to Helsinki or Dublin, but I would vote for a Chinese bid on a WorldCon! 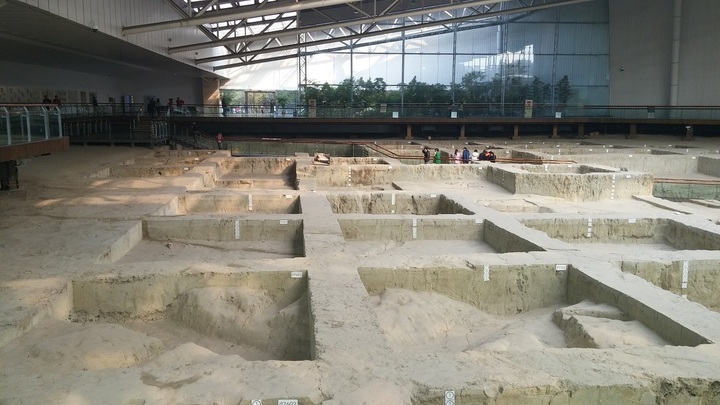 On the last day, we asked one of the editors of SFWorld to accompany us to an archeological dig in the city of Chengdu looking at the remains of a 3,000 year old culture. It was really big and cool and had 5 pavillions of museum displays and we walked around/over the actual dig. And, now that I’m over jetlag, I’m heading back to China on Tuesday, this time to Hangzhou. My other Chinese publisher has invited me and 9 other authors to meet with Alibaba to talk about tech and the future. I’ll report on it when I get back! Derek Künsken writes science fiction and fantasy in Gatineau, Québec. His first novel, The Quantum Magician, is being serialized right now in China in the magazine SFWorld before its publication in book form in the spring. The Quantum Magician will also be serialized across three issues of Analog Science Fiction and Fact magazine starting in the January/February 2018 issue, before it comes out in trade paperback from Solaris Books in October, 2018. He tweets from @derekkunsken.